This is still a favorite recipe from my childhood and now my kids can’t get enough of them. The recipe came from my Swedish grandmother but unfortunately I can no longer ask her the true source. The pancakes I have tried in Sweden are not quite the same since this version seems to have a higher egg ratio to the flour and milk. I have yet to see anyone here in Sweden eat pancakes like these, and certainly not for breakfast like we did growing up. But that is an interesting part of food culture when it becomes adapted to another country and transforms a bit. 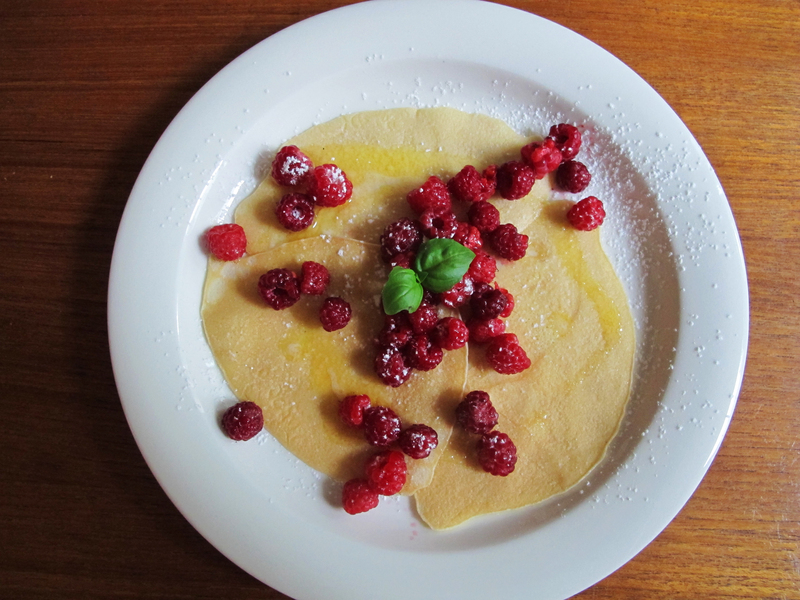 Swedish pancakes…..they’re not just for dessert anymore. They are great on their own with melted butter and powdered sugar, or they are even better with berries. 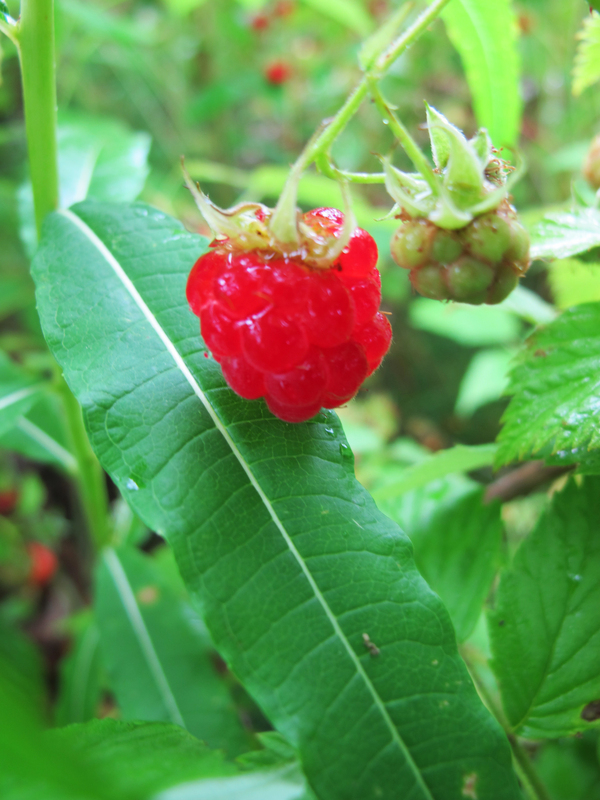 My sister-in-law Christina has an impressive patch of wild raspberries growing next to her house and they have been producing like crazy this summer. They are small, intensely flavored berries that easily outshine domesticated varieties. 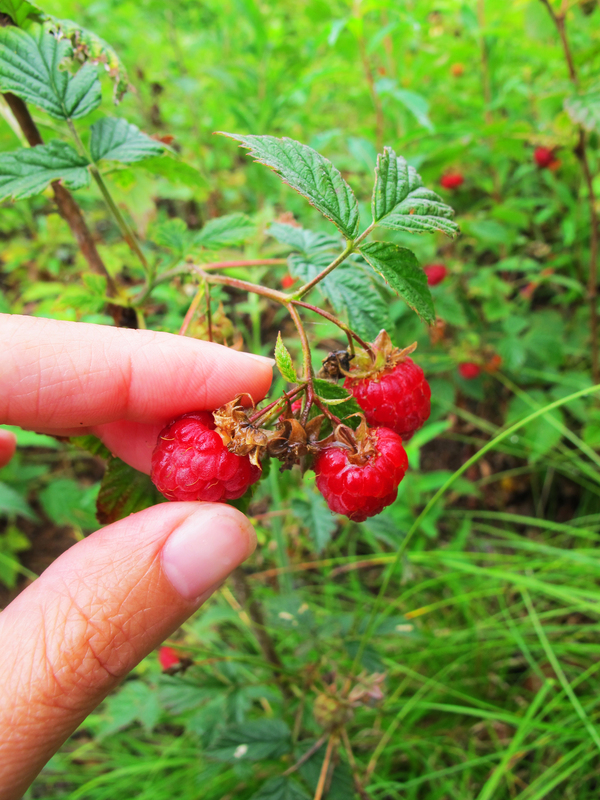 One small wild raspberry packs the flavor of at least five you could buy in the store. The smaller they are, the more flavorful they seem to be. 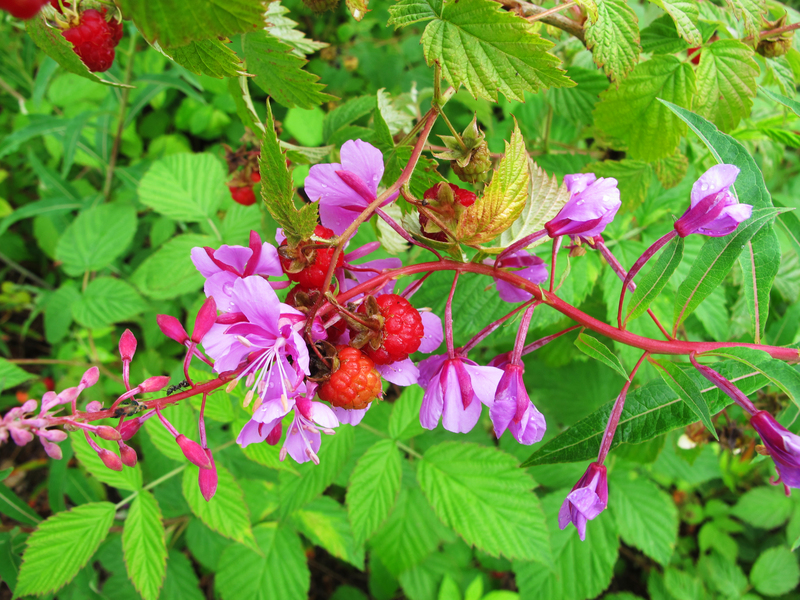 If you aren’t fortunate enough to have access to wild raspberries, fresh strawberries, blueberries, or blackberries would be a great option. Put the milk, eggs, flour, sugar, and salt into a blender and blend on low to medium speed until well mixed. Scrape down the sides if necessary and blend briefly again to eliminate any lumps. Cook the pancakes over medium high heat in a non-stick skillet. If you find the pancakes are sticking you can lightly butter the surface of the skillet. The pancakes are ready to turn when the surface begins to take on a matte look. Once you flip them they will be ready to remove from the pan quickly. They will stay quite warm if you layer them on top of each other in a serving dish or keep them in a barely warm oven. Serve with melted butter lightly poured over them, a sprinkling of powdered sugar, and fresh berries if you have them. We used to have a raspberry plant but it got unruly. I love fresh berries. 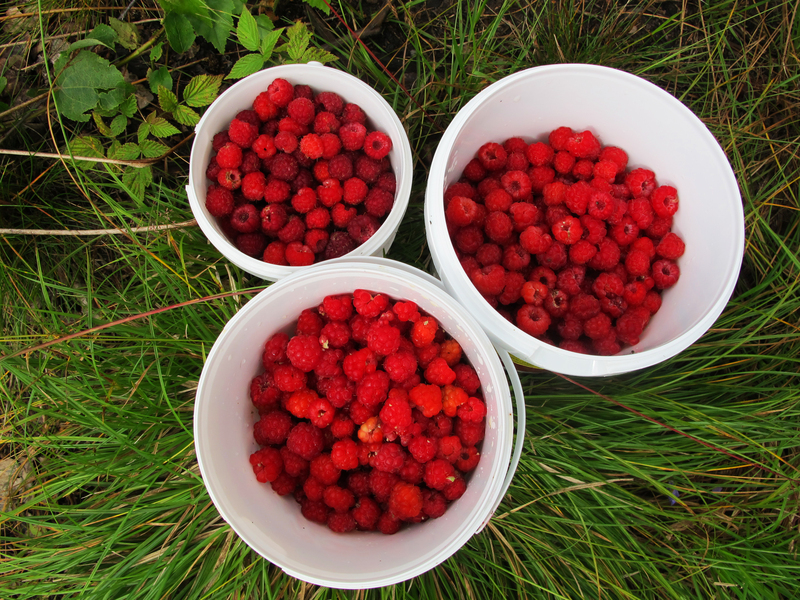 Went blackberry picking today, check out the results on my blog if you like! Checked out your site. I like the premise behind it. Hopefully I can get around to trying some of your recipes. Thanks for stopping by semiswede. We did this just the other day ourselves with our raspberry bushes in our yard. It was delicious. A wonderful combination and a favorite of my daughters as well. My kids love pancakes for dinner, DH don’t think it is dinner though so still have to cook a meal for him…. but he is happy to have a few for dessert!!! I made Swedish pancakes yesterday. We had them with Michigan maple syrup. Did you use this recipe from your mom? I’ve never tried them with maple syrup. I’m such a huge butter fan it’s hard to sway me from it. Your grandmother every now and then, in Idaho, would serve pancakes (American style) and fried eggs for supper. With butter and maple syrup. I always looked forward to that. Pancakes and eggs are a very nice supper. I made your recipe as soon as this blog came in and they were good. Today, the granddaughters lapped up the left-overs. I don’t recall any bacon or ham; it was probably an economy supper for them. I don’t recall LaVerna making Swedish pancakes in Idaho; I think that came about after moving back to Iowa. Our family still eats Swedish pancakes just like this, but with maple syrup and lots of butter just the way my Grandpa used to make them, it’s a family tradition. My great-grandparents migrated to the states from Sweden and we kept this tradition in the family, preferring these thin pancakes over the cakey, thick American-style ones. Love your site and reminder of my childhood recipes!